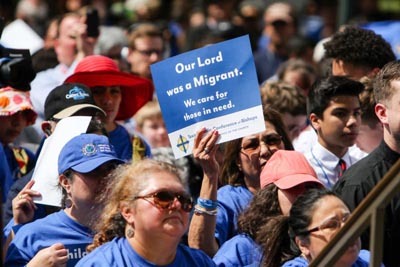 AUSTIN, Texas (CNS) — With blue shirts that matched the wide blue sky above, Catholics by the thousands joined their bishops who lead the state’s 15 dioceses at the Texas Capitol as one voice advocating for a number of issues as legislators met April 4. 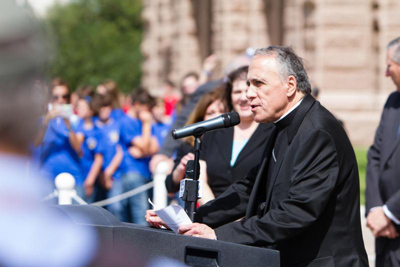 The event, which is organized by the Texas Catholic Conference, the public policy voice of the Catholic bishops of Texas, included a rally on the Capitol steps with the state’s bishops, several of whom addressed the crowds. More than 4,000 Catholics from across the state were registered to participate. Cardinal Daniel N. DiNardo of Galveston-Houston opened the rally with prayer, calling the faithful to “be the voice of the voiceless” invoking God’s blessing upon the efforts that support life, charity to all, welcome to the stranger and religious freedom. Austin Bishop Joe S. Vasquez, who is the chairman of the U.S. bishops’ migration committee, spoke on immigration. Bishop Brendan J. Cahill of Victoria led the Senate’s opening prayer just prior to the rally. The primary focus of Advocacy Day was to bring awareness to policies and programs that support the life and dignity of every human person from conception through natural death, as well as policies that protect and provide for the poor and vulnerable, ensure justice for immigrants, strengthen the family unit and those that ensure all people have easy access to adequate medical and behavioral health care. Like in Texas, Catholics around the country gather in their respective state capitals each year to be a voice for life and dignity and ensure lawmakers hear the Gospel message about caring for most vulnerable in society. As Catholics gathered in Austin, the same kind of advocacy event took place in Florida at the Capitol in Tallahassee April 4-5. Catholics from Florida’s seven dioceses gathered in Tallahassee for Catholic Days at the Capitol. Over the course of two days, participants attended a legislative briefing, visited with elected officials, observed the lawmaking process in action and prayed with and for state leaders at the Red Mass of the Holy Spirit. At meetings with their lawmakers, Catholic Days participants urged support for three proposals under consideration by the Legislature during the current session: codification of a program providing pregnancy support services; creation of a criminal justice reform task force and expansion of parental choice in education. On April 5, Florida’s Catholic bishops attended a breakfast meeting with Gov. Rick Scott to discuss several policy issues of importance to the church, such as pro-life concerns, parental empowerment in education, immigration and juvenile justice. In California, delegates from every diocese in California will gather April 25 in the state Capitol in Sacramento for Catholic Advocacy Day to bring to lawmakers’ attention issues of importance to the church, especially the need for transitional services for homeless youth, anti-poverty initiatives for children and families, and concern about efforts underway to make abortion medication, known as the “abortion pill,” available at on-campus health centers at colleges and universities in the state. “We travel to Austin to discuss and advance the social teachings which come to us from Scripture and the teaching authority of the church, and are inseparable from what we believe: that every human being is created in the image and likeness of God and has an inherent dignity and the right to life,” he said. “It is encouraging to know that thousands of Catholics took time away from their schedules to support our bishops and to advance the social and moral concerns of the church in pursuit of the common good,” he added. 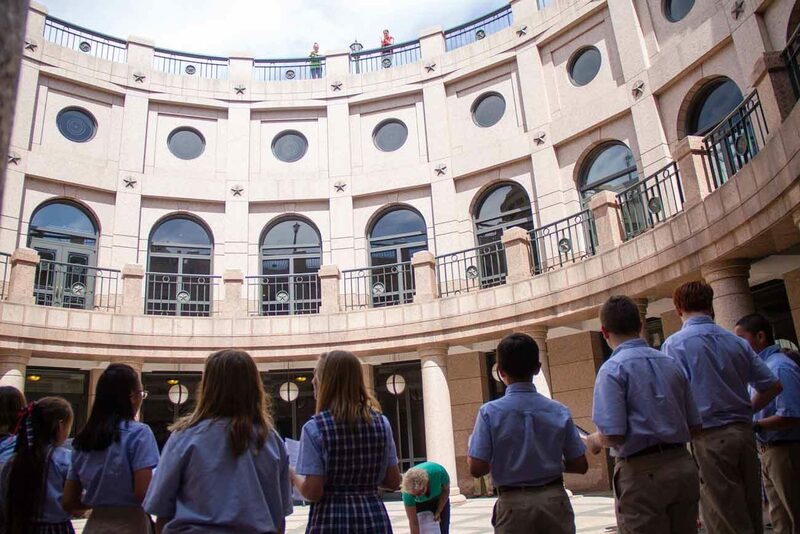 Having several thousand Catholics from across the state go to the Capitol as a unified group with one voice has a strong impact, Dunning told the Texas Catholic Herald, the archdiocese’s newspaper. Jennifer Carr Almon, executive director of the Texas Catholic Conference of Bishops, said the day was an exciting for constituents because they could stand in solidarity with their bishops and meet their local legislators who heard their points of view on important issues.